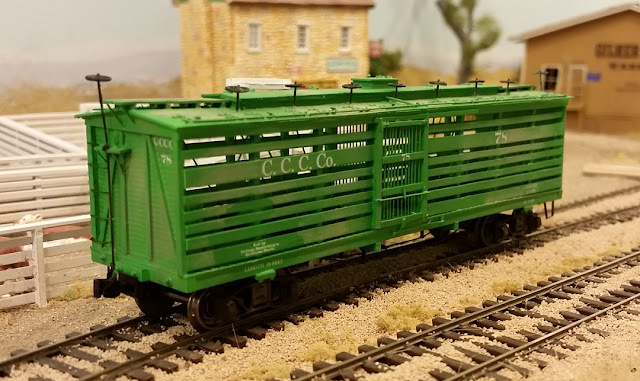 Canda Cattle Car Company car 78 sits on the siding at the Burnett's stock pen. The hatches on the roof access feed for the occupants while the hand wheels control partitions between the cows. The center hatch is for the water supply which is distributed by the piping along the edge of the roof. Some months ago (January 2017), I blogged about completing some Canda Cattle Car Company Stock Cars. At long last, I have just completed another Canda Cattle Car Company car, but one built at an earlier time. This model was apparently the first iteration of the "palace" car developed by Canda and built by Ensign. 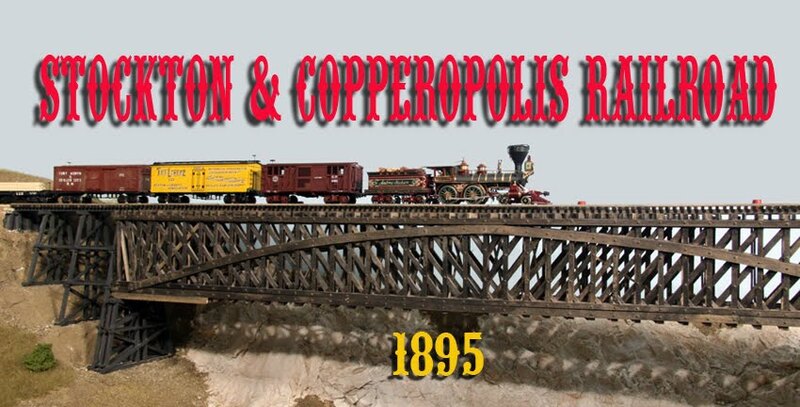 The prototype was featured in the March 2, 1888 issue of the Railroad Gazette. The article featured a good set of dimensioned drawings but, alas, no photographs. To this date, I have yet to find a photograph of this car. The car itself was 39 feet long and carried feed and water for the cattle so that stops for these items were reduced. In addition, partitions were provided between every cow or two to prevent them from injuring each other (or piling up at one end during an emergency stop). These partitions were controlled by the handwheels along the roof. Less than 200 of these cars were built as, by 1890, about 1800 of the type II car featured in my former blog post were in use. The model was built entirely of styrene in a jig to get the side slats reasonably straight. The trucks are Canda style trucks made by Bitter Creek Models and are very nice-looking. The numerous hatches on the roof all have hinges which are prominent. I had some 3D printed and they turned out nicely. The hand ring lifts on the hatches were made from Detail Associates lift rings. I still need a couple of models from Streets Western Stable Car Company and the Hicks Stock Car Company.